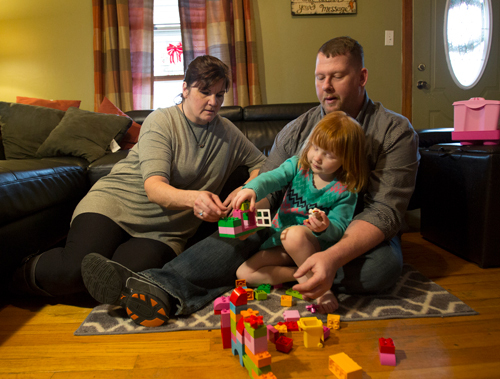 Patrick and Brenda Mirocha were in the process of adopting their 3-year-old daughter last year when they received a fortuitous phone call. Dupaco Community Credit Union’s Tammy Wood reached out to the Davenport couple because she wanted to help them save money. It was the first of many long-distance phone conversations that led to credit coaching and considerable savings for the family. Over the phone, the Mirochas participated in a free Credit History Lesson, learning how to drive up— and maintain—their credit scores. Wood showed the couple how Dupaco could save them money on their auto loans and help them tackle some credit card debt. The timing couldn’t have been more perfect, according to Patrick. “Now we can build up a safety net for ourselves and afford to put away money for our daughter for her future, too,” he said. Dupaco saved the couple $3,000 on their auto loans. Opening a home equity line of credit paid off their credit card debt, cutting those monthly payments in half. Patrick said the savings were unexpected and made a huge difference in the family’s finances. Because of their experience, the couple decided to open a checking account with direct deposit at Dupaco, even though the closest physical branch is more than an hour away. “With today’s technology, I can do everything from here hassle free and be very happy,” Patrick said.